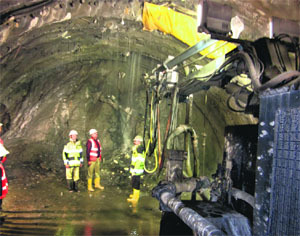 Inside the deep recess 2,000 ft below the rocky, pine-covered mountainside that forms part of the strategic Rohtang Tunnel, engineers and workers wearing masks, fluorescent jackets and knee-high rubber boots wade through slush and water, as giant boomers and heavy construction equipment rumble about under the glare of floodlights to control and deviate the steady flow of water that was not supposed to have been there in the first place. Unexpected and heavy ingress of water through the rock face has thrown up a new challenge for Border Roads Organisation (BRO) engineers engaged in the construction of the tunnel in Himachal Pradesh. While the ingress has slowed down the pace of the work as engineers battle the water flow, experts fear that if more such instances crop up ahead, it could impact the project’s schedule. The project is highly significant from a strategic point of view as it would provide all-weather connectivity to the sensitive Northern Sector. Road access to Kargil and Ladakh regions remains suspended in winters due to heavy snow. Besides allowing heavy vehicular movement under the frozen passes 12 months a year, the tunnel will reduce the road distance by 46 km and travel time by about three hours when it is completed by 2015. At present, water at the rate of 35 litres per second is flowing into the tunnel at the last point of excavation at the south portal. This implies that about 30.24 lakh litres, enough to fill up a small lake, is entering the tunnel every day. The inflow is spread over a small area and gives the impression of miniature springs. “The ingress was unexpected as the rock survey did not reveal such water presence at this point,” BD Jangde, BRO’s executive engineer supervising the work, said. “We are undertaking chemical grouting using polyurethane procured from Switzerland, rock bolting and pipe umbrella roofing, that involves boring steel rods and mesh, to strengthen and stabilise the overhead rock,” he said. The Swiss chemical is expensive and about 4.5 tonnes, costing about Rs 35 lakh, has been used so far. 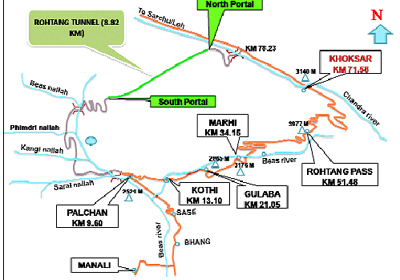 The 8.8 km tunnel, that would connect Kullu valley with Lahaul and Spiti, is being bored from both ends. The tunnel’s south portal is at Dhundi, about 30 km from Manali, while the north portal, approachable from the Leh side, is at Sissu. About 1,900m has been bored from the south portal and 925m from the north portal. 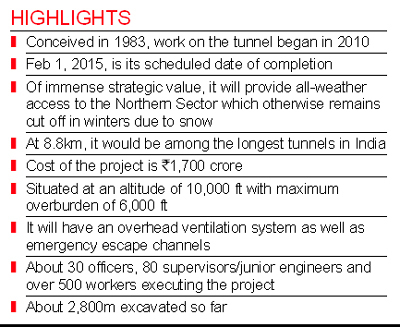 The Rs 1,700-crore tunnel project was conceived 29 years ago in 1983 to provide an all-weather route to Lahaul and Spiti in Himachal Pradesh and Ladakh in Jammu and Kashmir. At present, these are connected through the 13,000 ft-high Rohtang Pass, about 50 km from Manali, that remains closed for more than six months a year due to snow and high-velocity winds. Rohtang, in local parlance, means land of corpses. A preliminary study was done by the Geological Survey of India and Snow and Avalanche Studies Establishment in 1984. A detailed feasibility study was approved of in 1987 and that was completed by RITES in 1996. A high-level technical committee visited the site in 2001 and some modifications in the alignment were suggested. In 2003, RITES finalised its recommendations and the case was sent for Cabinet approval in 2005. In 2007, after approval of the Law Ministry, tender documents were issued and in 2009, contract for the tunnelling work was awarded to an Austrian firm, Stabag Afcons. The project was finally inaugurated in June 2010 and February 1, 2015, is the day it is supposed to be completed. About 300m ahead of the tunnel head is a rivulet flowing down the mountainside and the water flow is only expected to increase. Another nullah lies a few hundred metres ahead, but then these have already been factored in. At places, the tunnel would be about 6,000 ft below the surface. BRO officials said that unexpected and unknown water ingress or other geological factors could not be ruled out. These would have to be tackled if and when these were encountered. Situated at an altitude of about 10,000 ft, the Rohtang Tunnel is the first of its kind in India and one of the longest. It has a horseshoe-shaped cross section, with a rectangular module in the middle making up the paved road part. Above the ceiling of this module would be the ventilation system to ensure air supply and removal of toxic gases, while below the road surface would be the drainage system and an emergency rescue channel. To meet the challenges of the mammoth task, the BRO has also brought in an array of hi-tech and automated equipment, much of which is imported and some of which is being used for the first time in India. Rowa, a Swiss firm engaged in providing tunnelling logistics, has been contracted for highly mechanised drill and blast heading installation, jaw crusher and towing conveyor. A system procured from Finland has been installed to control and monitor the temperature of concrete to meet exact specifications, while automated multi-arm bombers from Switzerland have been deployed inside the tunnel for digging, drilling and boring. “Earlier, we were using manual boomers, but now, we have gone in for computerised hydraulic boomers that work in an automated mode. This has increased our working speed by about 25 per cent,” Jangde said. “The three-arm automated boomer that we have is being used for the first time in India,” he added. As the men and machines burrow deeper into the mountainside day by day, the biggest challenge will be to continue work in winters, when temperatures drop to sub-zero and snow blocks roads, as tonnes of soil and rock that has been excavated has to be dumped at designated sites and supplies and equipment have to be brought up. “The BRO is importing special snow cutters and blades soon to ensure that our work goes on uninterrupted,” Col Shukla said.